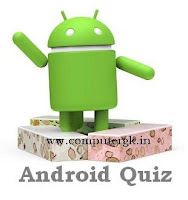 Android Quiz for Bank, SSC, PO, Railway, IT, PSU Exams: Android Quiz becomes integral part of various test of Bank PO, Clerk, SSC, IBPS, Railways, BSNL, PSU, IT Officer, and other competitive examinations. Computer GK Sample Question Paper as part of Computer GK Sample Papers. This Sample paper will also help candidates in Competitive Exams, PSU Exam, State Govt & Central Govt. Examinations held each years. You can check More MCQs including 100+ Android MCQs at our Free Mobile App of "COMPUTER GK" from Link: DOWNLOAD COMPUTER GK Mobile App . Here is sample Question paper as part of Computer GK Questions for upcoming examinations. What is Name of New Android version launched in July 2016 ? What was the first phone released that ran the Android OS? When did Google purchase Android? Android is based on Linux for the following reason. What year was the Open Handset Alliance announced? What was Google's main business motivation for supporting Android? What operating system is used as the base of the Android stack? Android releases since 1.5 have been given nicknames derived how?